Update: As of March 2016, Hongyok Lek is ranked #1 challenger for the Light-Flyweight WMC title (which is currently vacant). A few weeks ago, Kru Singh asked me to fight in Pichit on a show for the King’s Birthday, which falls on December 5th. Originally, Sylvie von Duuglas-Ittu was due to fight, as Kru Singh and I had been trying to help arrange some fights for her (something she mentioned in this post of hers). In the end, she wasn’t able to take that fight as she had another one booked for the same day, so I was put in her place. It worked out for both of us, as we both had fights schedules for the King’s Birthday. As soon as I agreed to fight, Kru Singh began training me much more intensively than usual. From that day, every session involved me working solely with him. Sparring, padwork and clinching was all done with him and was far more grueling than it usually is. Even when he had finished his rounds with me and was working with someone else, he would still be looking over and giving me instructions at the same time. It was like every session was a private, one-on-one class and I felt extremely lucky that he was putting so much time and energy into my development. It was clear that he really wanted me to do well in this fight. At first, that made me wonder. Was I due to go up against a really strong opponent? If so, that was great. I later found out that Pichit was Kru Singh’s old stomping ground, and the show was to be held by one of his previous bosses from many years ago. This fight would couple as a kind of reunion for him. Then, it made sense. He was aiming to impress. I found the whole idea really exciting and took a lot from the change in my training. There was a particular emphasis on clinching, and in order to help me improve in this area, Sylvie came to my gym to train with me a week before the fight. Pichit is around 350 km from Bangkok and the journey up there consisted of a taxi ride to Mo Chit Bus Station on the other side of the city and a six-hour bus ride from there. When we arrived, we were put in the back of a pick-up truck and taken straight to the venue, which was a small outdoor festival. These kind of fights are my favourite, because there’s no fuss. You just get in the ring, fight and get out again. There is no fanfare, just fights. That’s actually one of the main reasons why I’d rather fight in Thailand than anywhere else. Of course, along with that are also a few uncertainties – not knowing who your opponent is, what time you’re fighting, or generally what is going on most of the time! Eventually, you just learn to relax and go with it instead of wasting energy worrying about what you can’t change. I was pleased to find that the venue was relatively quiet when we first arrived. The seats around the ring were empty and there were no judges or officials to be seen, just a lot of people walking around. This meant that we had at least some time before the fights started, although I am always mentally prepared to be the first fight, since being female means that that’s usually what happens. We were greeted by some of Kru Singh’s old friends, who were extremely welcoming and couldn’t do enough for us. They offered us some food, I opted for just some eggs and rice. I made sure not to eat too much in case I was abruptly asked to fight. I’ve previously written about not being able to each much on fight day. Since I started fighting, it’s something that’s always been difficult for me. That, and an upset stomach due to nerves, are two things that I have consistently encountered with every fight. Those are two fairly normal ways for the body to respond to a fighting situation, something I wrote about in this post, ‘Pre-Fight Anxiety – The Fight or Flight Response‘. Funnily enough, I experienced neither of those things with this fight. Mental nerves are something that I worked towards casting out in my previous fight, but this was the first time that I was able to overcome those involuntary, physiological responses. I’m not sure entirely why that was, but I definitely felt better for it. I was totally calm. While we were eating, my opponent was brought over to my table, already in her fight gear. She was slightly taller than me, but the main thing that struck me about her was her make-up. None of my previous opponents have worn make-up and I never have done for a fight, but her face had been painted with blusher, shimmery gold eyeshadow, eyeliner and baby-pink lipstick to match her shorts, which also had bows on the side. Her name was Nong Mai and her fight name was Hongyok Lek Liangprasert. ‘Hongyok Lek’ translates to ‘small parakeet’ and her gym, Liangprasert, is a rather famous one in Uttaradit province, which is in the North of Thailand. There seems to be a lot of good, female fighters at that gym, and I later found that they all wear similar make-up for their fights. I discovered this when Santai Muay Thai posted some photos of them on the Female Muay Thai on Facebook – News, Archives and Rumours page. You can see those photos below. Although I can’t imagine ever wearing any make-up for a fight, let alone the amount that these girls wear, I like the fact that is seems to be a signature of their gym – it makes them a little more memorable. As we finished eating, the festival got started. Everyone lit candles and sang the Thai Royal Anthem, which was followed by a fireworks display. 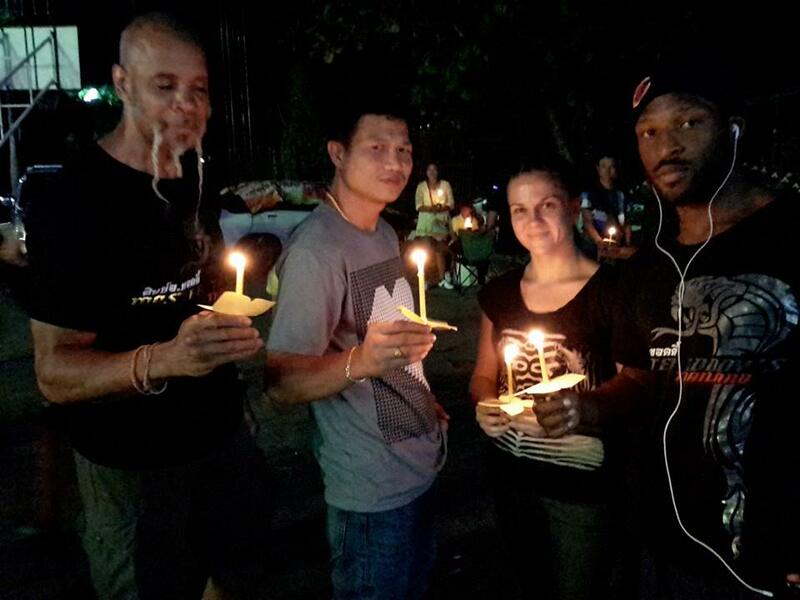 Below is a picture of myself and Kru Singh with Martin and Tu on either side of us (who were also fighting that night) during the candle-lighting ceremony. I love Kru Singh’s pose in this one. Also, here’s a video of the fireworks display, which was taken by our team-mate Tyler, who came along for the trip and took lots of photos. Immediately after that, the fights were due to start and surely enough, I was the first one. Remember those uncertainties that I mentioned before? We quickly set up a mat beneath some trees on a patch of grass. Kru Singh hurriedly wrapped my hands and I gave him the casts from my previous fight to speed it up a little. I looked up towards the ring to find that my opponent was already in there, mongkol on, waiting for me. I hadn’t even gotten changed! I rushed to the bathroom, threw my fight gear on and came back to the mat, where some oil and Vaseline was thrown on me, but there was no time for a massage or stretching, and certainly no time to shadow box. While that was happening, the referee kept looking over to check on us and it was clear that everyone was getting slightly bored of waiting. So, off we went. The ring was absolutely covered in bugs. Pretty sizable ones, too. I think this is a fairly normal occurrence in a province like Pichit, but it wasn’t something that I’d ever experienced before. 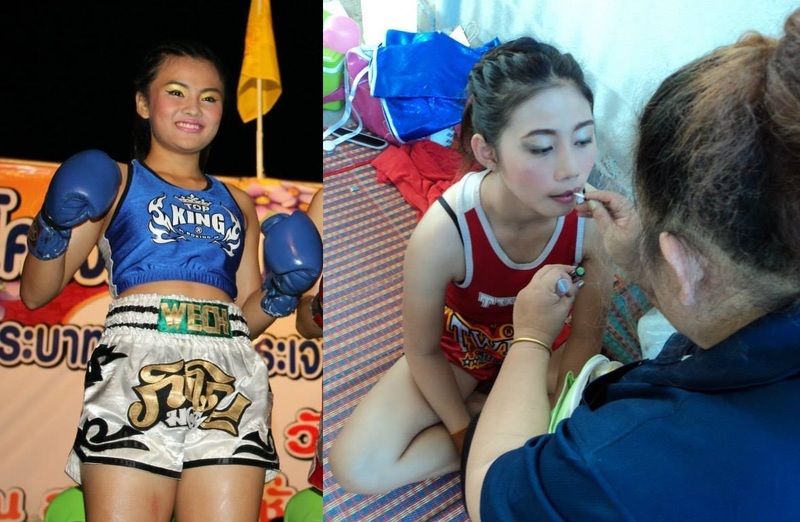 Hongyok Lek’s ram muay matched her attire, as she illustrated putting on make-up and combing her hair, in a similar style to the ram muay given to me by Master Toddy. In the usual fashion, we posed for a pre-fight picture and got started. The fight started rather slowly. This was partly because I’d gone in completely cold without a warm-up, but also because I was having trouble gauging my reach. Her arms and legs were rather long, which made it difficult for me to get within kicking range. I knew that this advantage meant that she would teep me a lot, so I kept my front foot light so that I could lift my front leg every time she tried to do that. It worked for the most part, but she definitely got the better of me in the first round. The second was more of the same, but she became more active with her kicks and landed a few of those as well as some knees early on. She was scoring well with those, and I went back to my corner knowing that I had to turn it up in the third. I did just that, and countered her kicks with punches. Halfway through that round, I had her in the corner with a flurry. After taking a few punches, she side-stepped out of it and I followed her to the next corner and did the same. This time, she clinched, so I threw two or three elbows over the top. I knew that I’d hurt her. The referee then pulled us out of the corner and I immediately noticed that a red lump had emerged on the right of her forehead. She began fighting backwards and landing kicks from a distance, so I pushed forward again, knowing that as the only way that I could fight her. Again, I caught her with some punches and she covered up and turned sideways and folded over, so I grabbed her head, kneed, clinched and kneed again. The referee separated us again and the bell rang. As I walked back to the corner after that round, I noticed the gamblers going crazy. The tables had turned and all of a sudden, it was going my way. It was both awesome and reassuring to know that I’d had a strong round and that the crowd, or at least some of them, were gunning for me to win. Round 4 is the money round, so I knew that I had to continue pushing forward through it in order to score highly and win the fight. I quickly learned that every time I did so, she was going to clinch and either throw one knee up and leave it there to stop me from countering, or just put her shin across my hips to block me altogether. Each time she did that, I tried my best to get the last knee over the top, but she would almost always sneak another one in just before we were separated. She used these techniques as defense for the rest of the fight. As most Thai girls do, she fought backwards, kicking and moving. For the last two rounds, this would work until I got her into a corner again, where I would snap her head back with punches and put her off-balance, but make myself susceptible to the clinch, where her height gave her the advantage. As the fifth round started, we had a good exchange of punches and kicks in her corner before she through four fast knees at my mid-section. None of them were effective, but they were definitely high-scoring and would have looked great to the judges. That punch/clinch exchange carried on from there, and she continued to use that knee block. That round seemed to be over very quickly, and although I knew that I’d won the third and fourth rounds, I wasn’t sure if that was enough to take the decision. Unfortunately, it wasn’t and Hongyok Lok was awarded the win. Still, I was very happy with how the fight went. Before we exited the ring, we were each given a golden Buddhist amulet, which Kru Singh later told me was a reward for a great fight, as none of the other fighters received one. 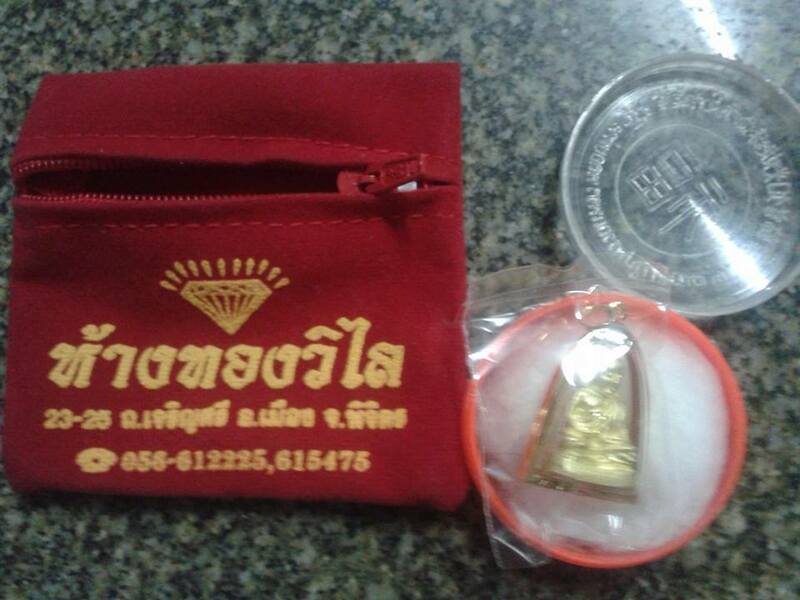 The amulet contained a tiny statuette of Luang Por Ngern, a famous monk from Wat BangKlan in Pichit. Amulets like these are believed to bring protection, luck and fortune. ‘Ngern’ can be translated to ‘money’ and this type of amulet is apparently associated with bringing wealth, in particular. It was a really lovely token to take away from my first King’s birthday fight and something that will serve as a reminder of my life here, if or when I ever leave (although I currently don’t have any plans to). As well as myself, three other guys from my gym fought. One of them was Kwan, Kru Singh’s nephew, who fought a great five rounds and won decisively as far as we thought, but wasn’t given the decision. The same went for Tu, who fought really well, with fantastic timing and footwork, but was outscored by his Thai opponent. After the fights finished, we hopped back into the pick-up truck and were taken to a nearby gym, where we were to wait for an hour and a half before heading to the train station at 1:30am. Again, Kru Singh’s friends took good care of us and led us to their rooms where we were able to lie down until then. By the time we got to the station, I could barely keep my eyes open and ended up taking a short nap on one of the wooden benches while we waited until just after 2am for the train to arrive. It was a third class train, which is undoubtedly one of the most uncomfortable ways to travel, with rock-hard benches to sit on. From there, it was a six-hour journey to Bangkok, during which I intermittently slept, with short periods of taking out my braids and generally being grouchy in between. 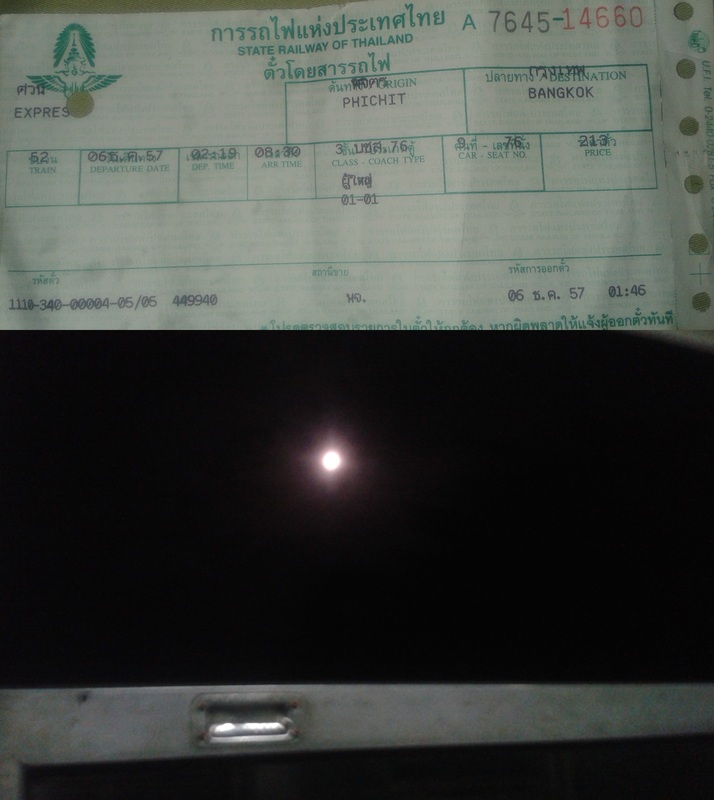 However, the moon was almost full and seemed abnormally bright, so it was nice to look at that through the window. You can see that in the photo below, which was taken at about 4am. When we finally arrived in Bangkok, it was just after 8am and a further hour after that, we were back at the gym. I was due to be at work at noon, so managed to get one hour of decent sleep before I had to do that, but the working day was quite a struggle. I almost always work the day after a fight, so it’s nothing I’m not used to! This fight was the first time that I’d had to travel quite this far, so that was a new experience for me. In hindsight, it would have been better to have gone up the previous day so that we would have had more time to rest before the fight. In an ideal world, I would never go almost straight from a 6-hour bus journey into the ring, but this is how these things happen. It’s all part of the experience, one that I am very grateful for. At first, I worried that perhaps I may have disappointed Kru Singh by not getting the win on such an important show for him, but he repeatedly mentioned to me that I had fought well, that he’d received lots of compliments for my fight and that he thought I should have won. That was really nice to hear. It was a good fight and Hongyok Lek had snatched it by inches in the final round, so I’m very happy with it. I also later found out the the rounds were cut short when I watched the video. The first two rounds, where I was at a disadvantage, were just under two minutes. The third was cut to 1:44 when I started to beat her, and the fourth, where I was really coming out on top, was cut even shorter to just 1:20! The fifth was 1:30. This isn’t the first time this has happened to me. A fight I had in March was cut short to three rounds with the bell run early in the final one as I almost stopped my opponent, who I was fighting on her home turf. Things like this aren’t unusual here. Having come out of this fight totally unscathed, I know that I did more damage to her than she did to me, and the actual result of the fight means little to me. As always there are things that I can improve from here. I’m happy, I fought well, I had a great time overall and now I’ve got some new things to work on. I can’t ask for much more than that. I discovered that my opponent also fought again on the following night at another King’s Birthday celebration in Uttaradit after finding this photo on the Muay Siam Facebook page. She’s on the far right, wearing the same outfit that she wore for our fight. She also won this one, which was against a girl from Sukhothai whose name I wasn’t able to get. 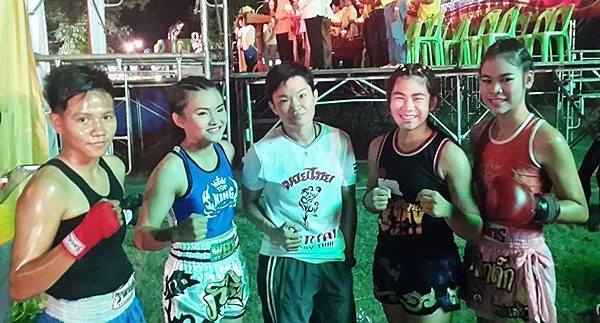 Next to her are Hong Thong Liangprasert, Marylin Santai Muay Thai, Nang Hong Liangprasert and Hong Morrakoht Liangprasert. 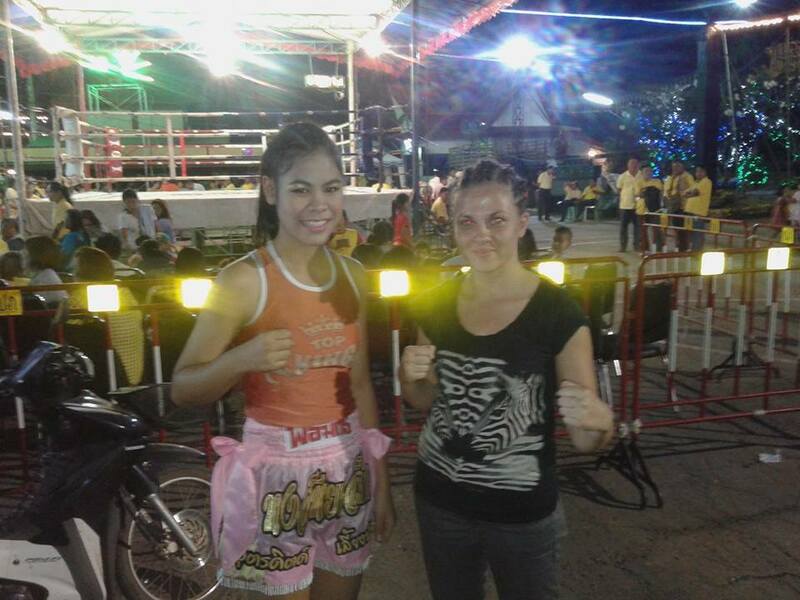 A couple of weeks before this fight, Hongyok Lek fought the same girl that I went on to fight in my next one, Pet Muaklek Kiatpompetch, winning on points at MBK Fight Night. See the video of their fight below. See below for a gallery of pictures from the fight (click to enlarge).